Today, a friend posted a meme on social media that stated, "Being good is not synonymous with being a jerk. Being good is a virtue that some idiots do not understand." Like many memes, it can be taken in multiple ways. Does it mean that they believe that anyone who meet their definition of good is a jerk? Or that anyone who they believe is a jerk, it not a good person? Does it mean that believe that they are good and that others do not understand? Or that everyone else is just an idiot? Whatever they were thinking, by posting this the persons risks being labeled as judging others that they do not know. That they feel that they are superior to others. This is just one more example of why you should not post memes, without thinking about the implications of your actions. Yes, we all suffer when we don't think before we act. We are responsible for the consequences of our behavior. What is good has been debated for centuries. For most it is simply being kind or all too often what they think of someone who is willing to meet their ever expanding expectations and demands on others — but there is a bigger picture of good that we would do well to consider. While every person will define good in a different manner they usually do so in a way that describes others and not themselves. Yes, we presently live in a most narcissistic world. There have been many definitions throughout history. But, most definitions are based in long-held beliefs that have been passed on from others. It is what your parents told you. It is what is demanded by others. It is what your God told you in a dream. It is what your culture believes you should be, or another belief, as we have all been told by others what it means to them to be good and most ultimately chose that to be their own belief — because if there is one thing that we can all agree on it is that the most commonly asked question in existence is, "What were you thinking?" You should define good based on what it means to you, personally, not what others want you to believe. You should put some thought into it so that you can ultimately find a way to represent good to others. A personal definition of good — that which each person will decide — should be based on what it means to them. 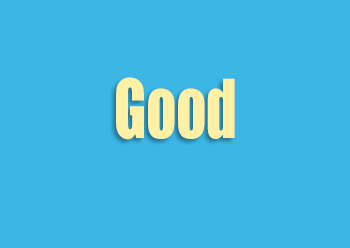 Thus, the definition of good should have a lot more to with your personal discovery of yourself and your role in life. You can, of course, choose to continue to define things by what you expect of others, in hopes that they will change their behavior and meet your expectations. However, you get what you give in life. To have others treat you in a good way, you first have to learn to treat them in the way you expect to be treated. They will in turn learn to treat you in the way you want to be treated. In order to truly be good, you will have to consider what 'good' means to you. It should come directly and purely from your mind and heart. Perhaps this means doing good for others, or simply being an honest and kind person. Being good is not a mask that you put on to make yourself appear to be something you are not — that you can remove at will and be capable of evil when it suits you. Trust me, no matter how good it makes you feel, people can see right through that cheap wig or comb-over. In order to define good for yourself, you should consider what your own 'code of moral values' are and what matters most to your personal belief system. After all, you have a code of moral values as a way of making decisions about everything you think, say or do — correct? If you have not yet created your own list of moral values, feel free to click here to download the two page Universal Moral Values Checklist for your own use. Of course, everyone has a different code of moral values, and it is possible that yours may conflict with what other believe. Keep in mind, however, that your dedication to a particular creed, ideology, or set of guidelines does not make you better than anyone else. Do what you believe makes you a good person on your own terms, and remember that it's an individual journey-everyone's path is unique. And, when you do good deeds, do not brag about it to others. As Alexander Pope said, "Do good by stealth, and blush to find it fame." "All the newspapers have spoken of the terrible fire at the Hotel-Dieu. They were obliged to remove the patients into the cathedral and the archbishop's palace. There are generally from five to six thousand patients in the hospital. 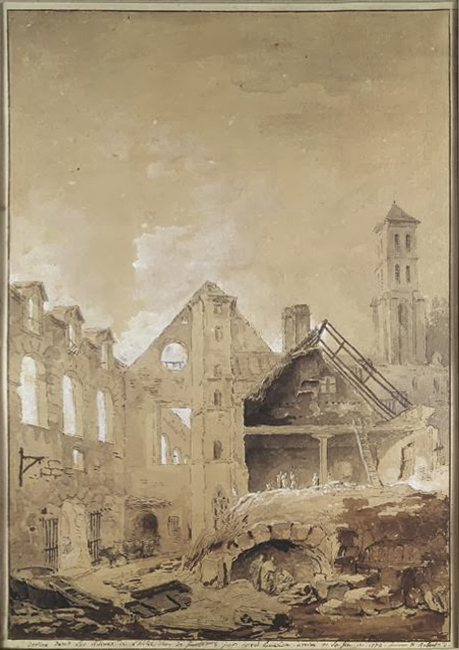 In spite of all the exertions that were made, it was impossible to prevent the destruction of a great part of the building; and, though it is now a fortnight since the accident happened, the tire is still smoldering in the cellars. The archbishop has enjoined a collection to be made for the sufferers, and I have sent him a thousand crowns. I said nothing of my having done so to any one, and the compliments which they have paid me on it have been embarrassing to me; but they have said it was right to let it be known that I had sent this money, for the sake of the example." If you find yourself in a situation with another person who thinks differently that you, consider their views. It is entirely possible that they know something you don't, which case you may learn something from them and update your own values. Or, perhaps their experience is limited, and you have an opportunity to help them broaden their own perspective. Being good should be done for the right reasons. While most understand that the little bad things in life; intentionally doing or saying things that are hurtful to others, lying, giving negative judgment or the big bad things such as intentional murder or theft should be avoided, being good goes beyond these types of behavior. Avoiding these is just the beginning in your journey to be a good person. You actually have to do good things rather than avoiding doing the bad things. And, of course, you will certainly be opening yourself up to judgment by others if you do not avoid these — just as the world judged past-USA-president, Bill Clinton, over the Lewinsky scandal, or Bush for bankrupting the USA in his warmongering greed in advocating aggression toward others for oil rights for his political allies. When you avoid being good, you can expect to be judged as a consequence for your poor behavior. On the other hand, there are usually few rewards for doing good, as it is expected that you will do the right thing by others and most of the good you do will certainly go unnoticed. And, rightfully so, as the only reward for being good should be your satisfaction in doing what you believe to be the right thing to do. Your intentions to do good are not enough. Simply making the decision to do good, or even trying to do good is a start, but it is your actions that make you a good person. You must unselfish in willing to put the needs or wishes of others before your own, just as Marie Antoinette did in donating money anonymously to the sufferers of the Hotel-Dieu fire. There will be times when you attempt to do good, and it does not work out the way you planned. For example, we all misspeak from time to time or we are late to an appointment and kept another waiting. When we do and are wrong in our actions, we should expect and accept certain consequences for having done so. You must be willing to reconsider your actions and make improvements. Your own morals may imply that misspeaking or being late to an appointment is normal behavior. However, when you inflict some harm to others in your actions, you have to willing to consider not only your own morals, but those of others. As Isaac Asimov said, "Never let your sense of morals get in the way of doing what's right." In this case, you should apologize for offending the other person's sense of morals. This past week, there was a huge landslide in the village of El Cambray II, in Santa Catarina Pinula, about 15 kilometers east of Guatemala City, Guatemala. The known death toll has risen to 131 people, including children and newborn babies, and is expected to continue to rise as emergency crews dig through tons of earth for an estimated 350 missing people. Authorities say finding any survivors from the landslide that buried hundreds of people under tons of earth is highly unlikely. Hundreds of rescue workers, many unpaid and attempting to do good by digging to find survivors buried in the 125 homes that were covered by the mud. President Alejandro Maldonado said several countries, including Mexico, the United States and Cuba, are assisting with relief efforts. The landslide was among the worst ones in the recent history of landslides in Guatemala, and can, by its severity be compared to a landslide in southwestern Guatemala from October 2005, that completely buried the Panabaj village. Hundreds of people died and, unfortunately, a large number of bodies have never been recovered. However, when the digging stops in El Cambray II and hundreds are left behind buried, the person who signed off on the sale of the land and the permits to build homes in the ravine between these two mountains will likely be considered as acting in extremely poor judgment. They should have never allowed the village to be approved in a country that has suffered heavily from landslides. It is obvious that this person was certainly not acting on the greater good in mind, when they approved the permits. In all likelyhood, this person may and should perhaps be brought up on murder charges. Yes, sometimes people often do right things for the wrong reasons, and wrong things for the right reasons according to what they believe is good, but that does not make it right to take actions that are not good for long-term impact on others. We must each suffer the consequences of our behavior in every instance. It is not always easy to be good. If it were, then every good-hearted person would be good, and we know that is not always the case. We all know people who have done good things at one point and still committed bad things, as well. We must find a healthy balance between the two extremes that can lead to closed-mindedness. In Buddhism, and in most spiritual beliefs, there is a term for this balance known as the 'The Middle Way'. Be humble and kind to others, but do not allow them to do harm to your peace and serenity. Be responsible with your money, but allow yourself to give a helping hand to others in need. Be positive in your decisions, but learn from your mistakes. Be honest in your actions, but do not violate others rights to privacy. Be helpful, but allow others to learn some things for themselves. Try to find the middle way in these examples when they arise in your life. Never jump to conclusion, but carefully consider what you think, say and do, and assure that you are making the right decision and not one of of closed-mindedness. Be open-minded instead. If you believe that another person is doing something that your moral code says is wrong to you, give others the benefit of the doubt, as they are acting on their own moral code. Attempt to discover what prompted them to act in the way in which they did, and if appropriate, consider explaining how you feel about the act. Helping others in an open-minded manner may result in your own journey towards being good. Being good in a relationship may sound like a no-brainer, but surprisingly it creates many of the problems that exist in relationships — one person acting in a manner that the other does not approve of. It is especially important in a relationship to follow the adage of 'Learn-Give-Get'. Learn: We must constantly improve upon our understanding of others by learning what the other person considers good and bad and work toward the middle way. Give: We must act as guide to others by giving them assistance. By being present with a genuine desire to help them thrive. Get: Our actions will influence others as they recognize that we are acting in a good manner. When other people see you doing good deeds, they will be reminded to take more positive action themselves. In this way we will get goodness returned to us many times over. While in our present society there is the inclination to focus on the bad things that are happening around us — it is detrimental to our sense of peace, serenity and tranquility. Instead focus on the good, finding reasons to be happy. Be particularly focused on the small acts of kindness that you or others are doing. These will act as a constant reminder of those things that are more enjoyable. If you fill your day with these positive acts of good, you will find yourself amid the company of good people, doing good acts and will be more likely to act in more positive and good ways in all that you do. 2. Alexander Pope - an 18th-century English poet. He is best known for his satirical verse, as well as for his translation of Homer. 4. Isaac Asimov - an American author and professor of biochemistry at Boston University, best known for his works of science fiction and for his popular science books.